• Multifunction buttons - scene recall, impulse, toggle and dim. • Indicator LED’s with seven user selectable RGB colours and intensity. Red, Green, Blue, Magenta, Cyan, Orange and White. 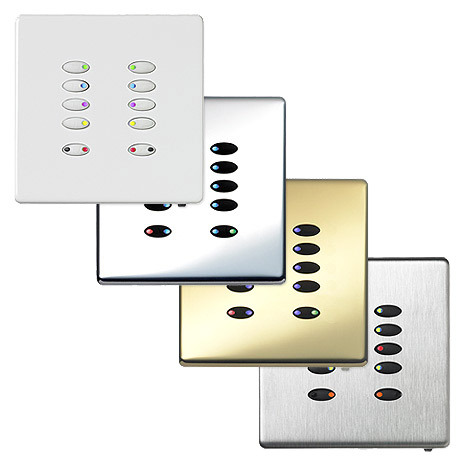 The 10 Button SGP Control Plate provides ten configurable buttons allowing scene recall, impulse, toggle and dim functions. The indicator LED’s within the buttons are RGB and dimmable, therefore seven colours of selectable intensity are available. Where buttons have a multifunction i.e. Toggle On & Off, the LED colour can toggle, for example Green & Red to provide current status. The SGP Control Plates are connected using the MBUS Dataline which is common to all Evolution, eDIN and ecoControls system controllers.